I know that my friends and family's hearts will sink to see this post appear on their social media feeds. I know they are sick to the back teeth of hearing about this cake. But I promise this is the end of the wedding cake talk, until the next one at least! The Finished Product - slightly right of centre but standing! I had originally been building up to making a wedding cake for my friend Anne for her NYE wedding but when the lovely Patrea asked me about 6 weeks ago to make hers for 1 November, I was certainly not going to refuse!I did have more than a few moments of panic as I remembered I had only made 1 stacked cake ever before (2 tier, this was to be 4), never mind a wedding cake. The bride was incredibly laid back which helped a lot but still, this was someone's WEDDING and I didn't want it to be a mess. So I began to do research - a lot of research! 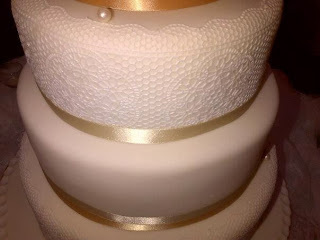 One site I found to be invaluable was Cake Central, which, if you can get past the occasionally preachy tone of some contributors, is an absolute goldmine for info; how to dowel correctly, when to ice, what gumpaste is best, it was all there and I am honestly indebted to the community there for helping me ensure the cake wasn't a disaster!. 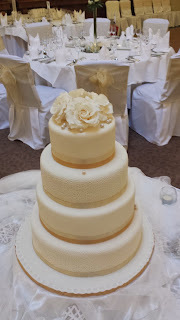 I knew I wanted to take this opportunity to learn as much as I could in the process and in fitting with the bride's preference so decided to make gumpaste roses, handmade pearls and also to use my great (but expensive at 100e a pop) Sugarveil kit. 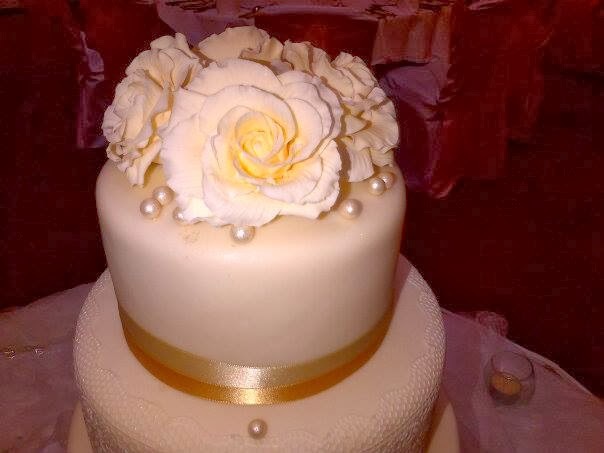 I had made roses before in a one day class but they certainly weren't at a standard I would have been happy to put on a cake. So I practiced - a lot. The pearls were a pretty tedious process but I discovered the best way to get them all the same size as to use marzipan spacers to make sure the paste was all the one thickness before cutting with round icing bag tips, rolling and dusting in lustre powder. 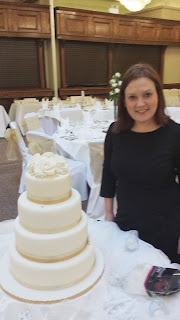 I have a loooong way to go in my cake journey and am certainly no expert but here are some things that might make a first-timer find the process that little bit more managable. 1) Let go of the search for perfection. If this is your first wedding cake, you are probably not a professional cake baker/decorator. Cut yourself some slack. That's not to say you shouldn't try your best but having a breakdown over a crack in a broken sugarflower or a crack in the icing (in my case!) won't help anyone. Remember, ribbon hides a lot. 2) Think about how early you need to start your decorations etc and start a week earlier. Even though I did 'a bit (of varying lengths) pretty much each day for 3 weeks, I was still up against it as the date apprached (not to say I didn't enjoy it but it WILL take longer than you think, especially if making anything involving gumpaste decorations. not to save time/get ahead but instead to lock in moisture. I baked mine 4 days ahead and froze them wrapped well in greaseproof paper and cling film and I think they were as moist as if id baked them that morning. You can also freeze your buttercream ahead. 4) Don't scrimp on the sugarpaste. There are a lot of cheaper sugarpastes on the market at the moment (from Aldi etc) and I have used them with varying degrees of success but I'd definitely recommend buying one of the professional brands for such an important cake and definitely one which you have practiced with before. You want to give it and yourself the best possible chance of not cracking under pressure or tearing as you life the big sheet from the table.I used Regalice. 5) Use tried and tested recipes. Now is not the time to experiment! It can be tempting to try out new things but its probably best to save that for a rainy Saturday afternoon when the stakes aren't so high! 6) If using, lay a sheet of kitchen roll over your dried gumpaste flowers. I freaked out about a week before the wedding when I saw the fruits of all my hard work start to droop slightly as a result of the high humidity! (damn you Irish weather). I am convinced doing the above helped minimise the damage (that and placing them in a breathable cardboard box). but also looked on it as the chance to improve/develop some of my skills. Don't take on a request to make a cake if your heart isn't in it because the stress that WILL follow just won't be worth it and you may start to resent the whole thing!